Our last day in Cuba was meant to be spent exploring Cuba independently; I felt as if I had already experienced everything but wanted to do it all again before we had to leave. We crammed every possible adventure into our last twenty-four hours. Now, thinking about the New England cold as an eight-inch snowfall looms over our return, I want our jam-packed final day to last as long as it possibly can. Abby and Liam, thrilled to be riding the ferry. I started my day on a packed ferry to Regla, visiting the museum of Santeria, a religion developed in Cuba by the Yoruba people as a way to merge their religion with the Catholicism that was forced upon them by the Spaniards colonizing the island. 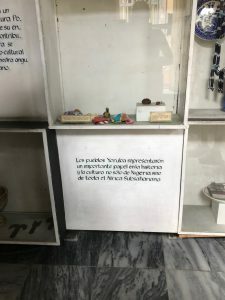 Santeria has adapted Christian symbols, including the use of Lazarus as a god, a virgin mother figure, and crucifix figures scattered throughout the art in the museum. I found the way that Santeria grew as a way to adapt to the rule of Cuba at the time interesting, and an example of a common theme that I found throughout my trip: Cubans have to adapt to whatever power is trying to exert itself upon them. 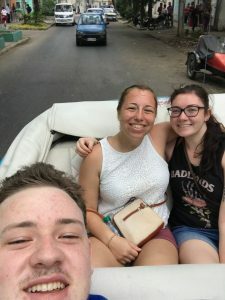 A convertible ride back to our residencia brought me back from my admiration of Cuba’s resilience and to my goal for the day: to experience as much as I could again before our two short weeks in Havana ended. After lunch, a group of us walked to Café O’Reilly, a coffee shop that had become one of my favorite places to relax for an hour. On the way, we met a man that gave us directions to Old Havana and discussed his experience in Cuba. He worked in creating curriculum for public schools and angrily ended our conversation when we mentioned the coffee shop, asking us why Americans chose to frequent government-run shops instead of supporting small private businesses. Even though we had eaten at multiple paladars, privately-owned restaurants, I had almost forgotten that not everyone in Cuba is happy with the socialist government. After our final coffee shop visit, which was a reminder of the scarcity of some resources in Cuba when the shop didn’t have the condensed milk needed for a Café Tres Leches, my favorite drink there, we walked through the packed streets of Old Havana one last time. I found an aviary that I had probably walked by every day but hadn’t noticed. It made me realize how much I had probably missed. (And made me begin to plan a return trip to experience everything that I may have distractedly passed by.) We took a newer cab back to the residencia to meet for our farewell dinner. The ability to ride in an antique car from the 1950’s and a newer Audi in the same day never stopped amazing me; I expected every car in Cuba to be antique, and the newer models proved that Cuba is moving forward much more than I had expected. Our farewell dinner had me more focused on conversation than on the (insanely delicious) food that we were enjoying. It’s strange to spend two weeks with the same twelve people, and barely any contact with the outside world, and then expect to go back to normal life at home. These past two weeks weren’t just about going to class and exploring Cuban museums, they were about immersing ourselves in an unfamiliar country and culture and trying to absorb as much of it as possible. Part of that immersion was forming the relationships that we did, even if it was a father-son bond with our bus driver, Arturo. Receiving certificates of completion from the CEM, (Centro de Estudios Martianos) where we attended lectures, made the end of this adventure feel real. Cuba will always be a part of all of us, in the memories, souvenirs, and slightly-too-close-up photos of each other, but especially in the friendships that we’ll maintain when we come home. 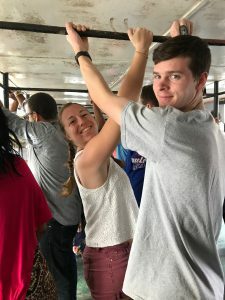 This entry was posted in Uncategorized by kasey_mearls@student.uml.edu. Bookmark the permalink.